THE BIRTH OF A PRINCE Of WALES. AIR.—"King of the Canibal Islands." AROUSE, arouse, with heart ana voice. A Prince is born in England, rejoice ! Here's a heir to the throne of England! And a heir to the throne of England. As sure as Whittington had a cat. Here's an heir to the throne of England. And the nurses shouted we have a king. And sang, as he made the caudle hot. For the hair to the throne of England. With his young bonny Prince of Wales. To the heir to the throne of England. The Queen has got a pigeon pair. An heir to the throne of England. The heir to the Throne of England. You bonny lasses gay and keen. BIRT, Printer, 39, Graet St. Andrew Street, Seven Dials. 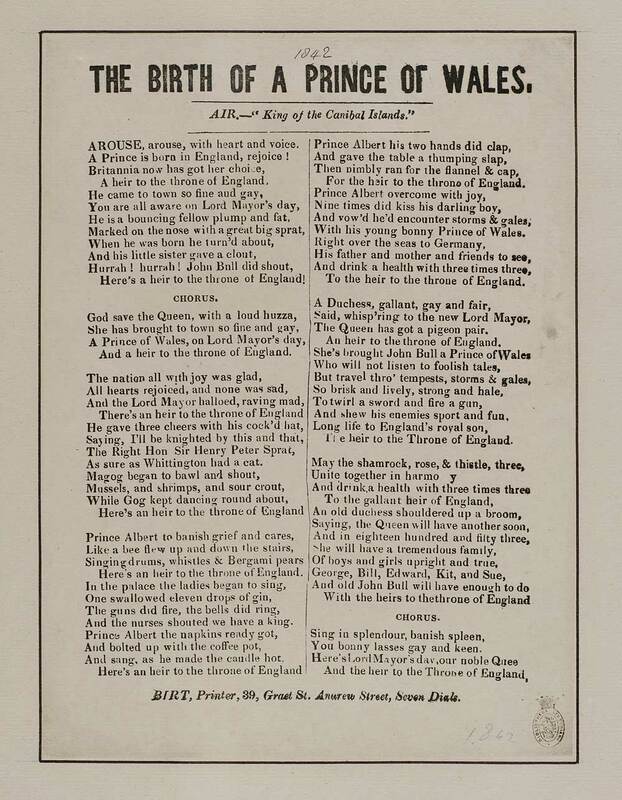 The ballad celebrates the birth of Edward, (later King Edward VII) first son of Queen Victoria and Prince Albert. He was born November 9, 1841. First line reads: Arouse, arouse, with heart and voice. In two columns. Air: - King of the Canibal Islands.